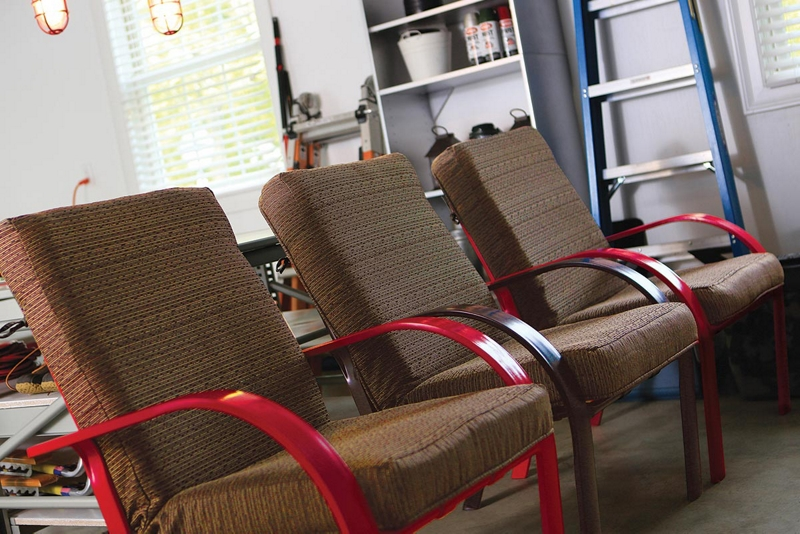 Revitalize metal indoor/outdoor chairs with Krylon® Rust Protector™ Gloss Enamel in complementary colors to personalize your space. Using an all-purpose cleaner/degreaser, wipe down chairs to remove all dirt and grime. Rinse thoroughly with water and allow to dry. We painted two chairs in Krylon® Rust Protector™ Gloss Enamel - Cherry Red and one in Black. If you would prefer to create a pattern using both colors on a chair, use painter's tape to mask off your design. Turn chairs upside down and begin painting the bottoms first. Applying in a well-ventilated area, hold can 6-8 inches from the surface and paint using a sweeping side-to-side motion with slight overlap. Krylon® Rust Protector™ Gloss Enamel dries in 8 minutes or less, and can be handled in less than one hour. Once dried, turn the chairs right side up and finish painting them.